By Xah Lee. Date: 2007-10-30 . Last updated: 2018-11-04 . 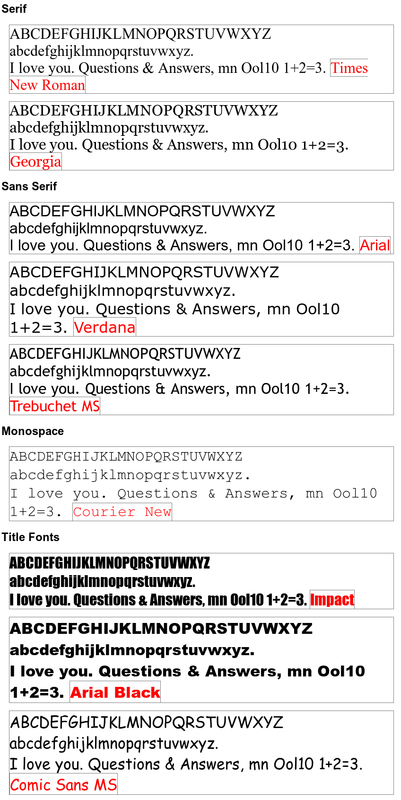 Standard Web Fonts are fonts that are available on Windows, Mac, iOS. (but not on Android) Also know as web safe fonts . Here's a screenshot of how these font actually look like. Here's how they look in your browser. If you are on Linux, or Android phone, you may not have the font, and your browser will actually use a different but similar font. ABCDEFG HIJKLMN OPQRST UVWXYZ abcdefg hijklmn opqrst uvwxyz. I love you. Questions & Answers, mn Ool10 1+2=3. If you want more font choices and also make sure your readers see the same thing, see: Google Webfont Tutorial.